This solid state relay (SSR) allows you to control high-current AC loads (up to 10A) from lower voltage DC control circuitry. This solid state relay (SSR) allows you to control high-current AC loads from lower voltage DC control circuitry. Solid state relays have several advantages over mechanical relays. One such advantage is that they can be switched by a much lower voltage and at a much lower current than most mechanical relays. Also, because there’s no moving contacts, solid state relays can be switched much faster and for much longer periods without wearing out. 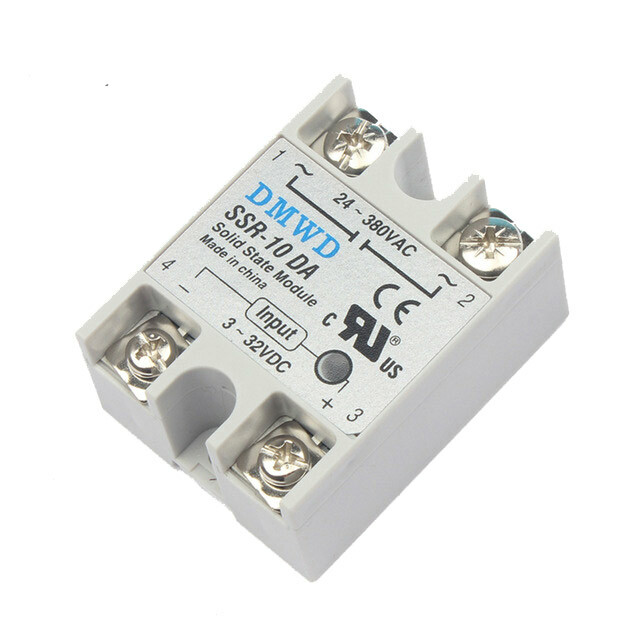 This particular solid state relay can switch current loads of up to 10A with a 3-32V DC input and a zero cross trigger control method. Each one of these relays is equipped with four screw terminals (for use with ring or fork connectors) and a plastic cover that slides over the top of the relay to protect the terminals. I got one solid state relay, works just as advertised. Very satisfied with the product.